Yesterday I made my way out to CAEP host, Rood and Riddle Equine Hospital, to meet with their new trainees! 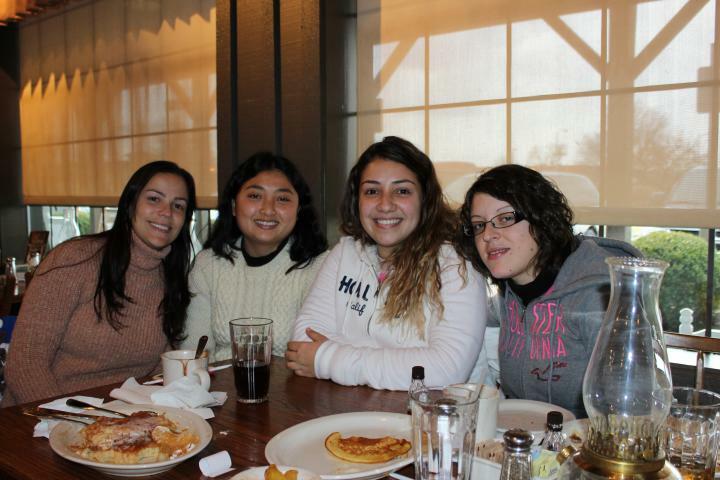 It was great to meet Amanda (Brazil), Manuela (Italy), Carolline (Brazil) and Cinthia (Brazil)! Our first stop was the Social Security Office so that they could apply for their SSN and start the process of looking for a car to buy. One teller helped us with all four applications and we were in and out of the Social Security office in only 45 minutes! The new Social Security office in Lexington is great to work with; very efficient. Our next stop was Wal-Mart to pick up a few items. Since all the trainees are working the night shift, they need to darken their rooms for sleeping during the day. We picked up some black out shades and I am going to try and find some sleep masks for them! Our final stop was to a Cracker Barrel Restaurant, to experience typical Kentucky country cooking! 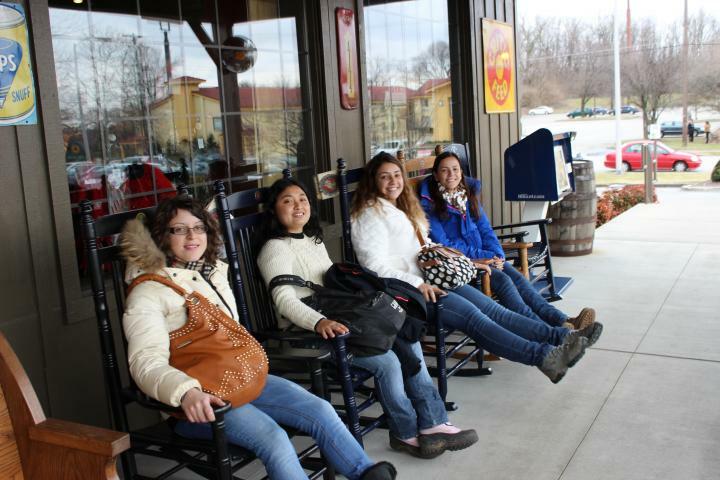 Each Cracker Barrel has a store, which the girls enjoyed browsing for ideas for souvenirs and I also pointed out the University of Kentucky fan wear in the distinctive blue– they even had rain boots with the University of Kentucky logo! I highly recommended that everyone goes to a University of Kentucky sports game (especially men’s basketball) if the opportunity presents itself! It can be hard to get tickets if you are not a student or alumni. Carolline has a friend who is studying at UK and will definitely be hitting him up for tickets! At Cracker Barrel, we ordered a variety of things including bacon, eggs and buttermilk pancakes with warm syrup. I also ordered Biscuits and Gravy, as well as Cheese Grits, which are a typical breakfast items eaten by Kentuckians. I am not a fan of either, but Cinthia, Carolline and Manuela had a small taste. They said that the food was “interesting…” But the look on Manuela’s face tells the story quite well! Our last picture is of them testing out the rocking chairs on the front porch – they look forward to trying them out again in warmer weather! On the drive home, I pointed out the Kentucky Horse Park, which I suggested waiting until after March 15 to visit, once the outdoor Equine exhibits start again. There is so much to see and enjoy there, but for warmer weather! We also passed a few other clinics which they hope to visit. I gave them the link to free things to do in Lexington, KY. They’ve already visited Keeneland Racecourse to experience the January Thoroughbred sales, but plan to go back during the April Race meet. There are so many things to do in Lexington, especially once the grip of winter is gone, including Thursday Night Live at Cheapside Park, with local bands and food. I look forward to seeing more pictures of Amanda, Manuela, Carolline and Cinthia experiencing KY in the coming months!